Halloween is such a fun time of the year. Both young and young at heart seem to get into the mood when this holiday rolls around. 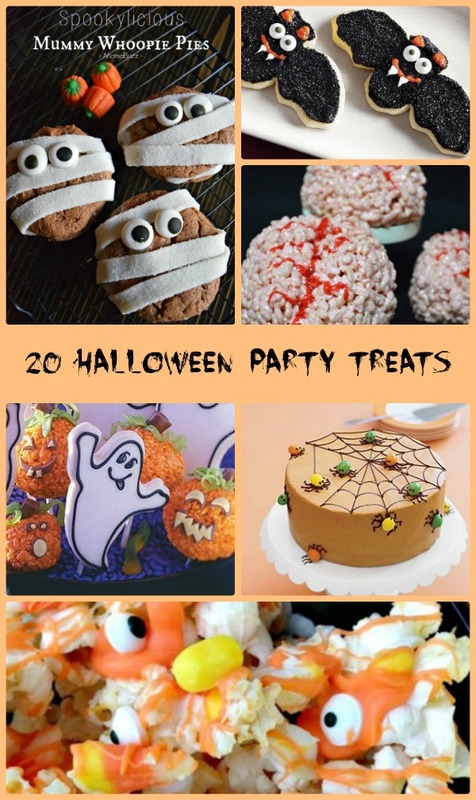 These 20 Halloween sweet treats will be perfect for your party table and are fun to take to school for a great Halloween snack. 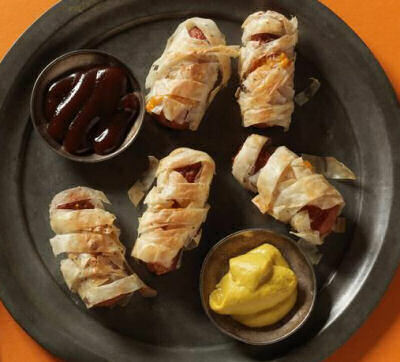 Most are sweet treats, but I’ve included a few savory Halloween recipes too. These are Halloween Sweet Treats Your Whole Family Will Enjoy. These Halloween inspired treats would be fun to serve at a Halloween Cookie Swap. See my tips for hosting this type of party here. 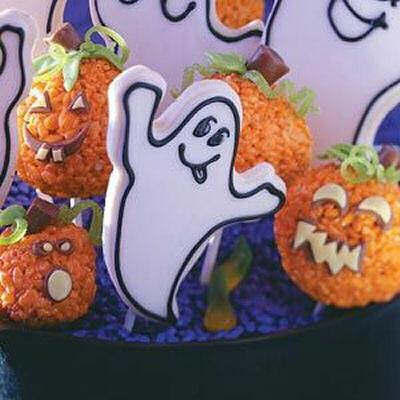 From chocolate mocha mummy cookies and Krispy Crunchy Bones to wicked witch baked potatoes, the mood is to add a bit of spooky fun to meal times, party times or anytime! Join me as I round up the my favorite Halloween sweet treats. Looking for a ghoulish Halloween sweet treat? 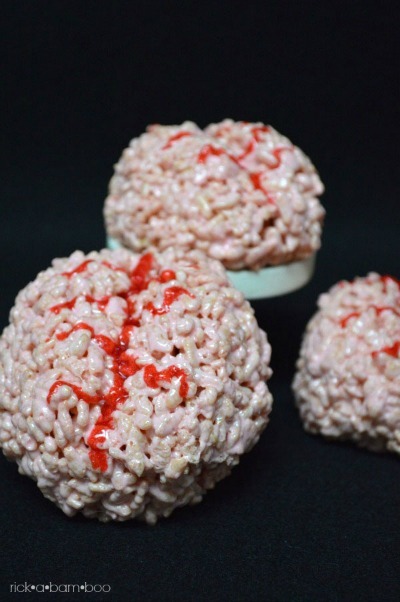 These Rice Crispy Treat Zombie brains will spook your party guests big time. Get the recipe on Rick a Bam Boo. 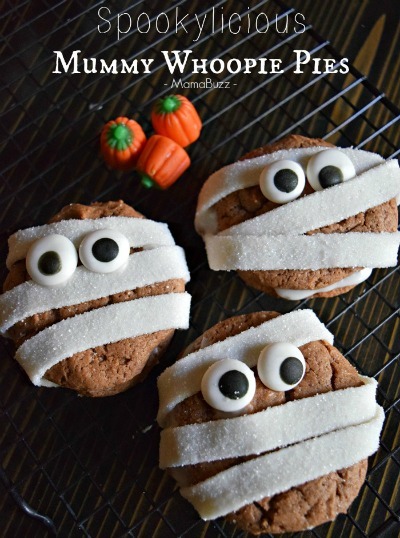 These adorable mummy whoopie pies will be the hit of the night. White candy strips make the mummy wrap and the eyes add just the right spooky touch. Get the recipe at Adventures of Mel. 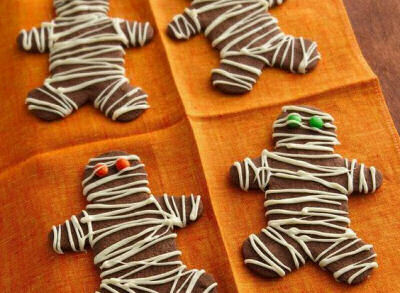 These adorable mummy cookies are made with instant coffee granules. The grown ups will love them! See the recipe at Pillsbury. Ghostie snacks are always popular at Halloween. These super cute ghost cookies will be gone in a flash. See them at Taste of Home. If you want to scare your guests silly, try these Halloween bloodshot eyeball cookies from Creations by Kara. 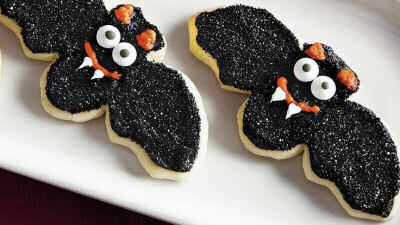 Get out the bat shaped cookie cutters and have some fun decorating these spooky cookies. See the recipe at Pillsbury. 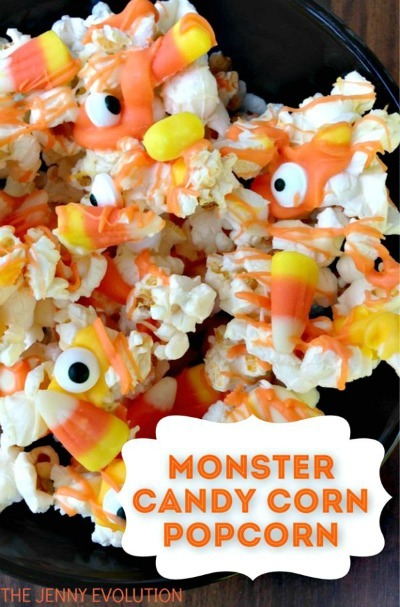 This Halloween monster candy corn popcorn from The Jenny Evolution makes the perfect Halloween party snack. Get the recipe here. These are not sweet, but would still be loads of fun on your Halloween party table. 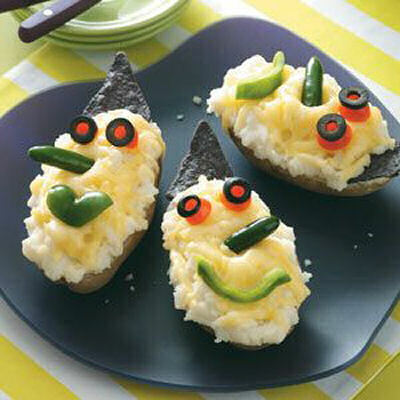 Get the wicked witch potatoes recipe at Taste of Home. These hot dogs are cut in half and then wrapped in crispy phyllo pastry for a fun party snack. Get the recipe at Food Network. Feeling a bit ambitious? 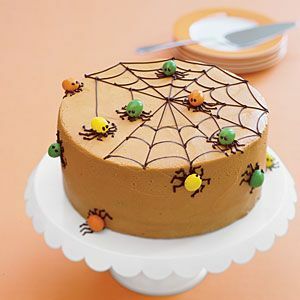 Try making this spooky Halloween spiderweb spice cake. It has the delicious spice cake flavor and fun decorations that the kids will love. Get the recipe at All Recipes. Looking for some more fun Halloween dessert ideas? Try one of these sweet treats. 3. Witch Finger Halloween Cookies. 4. Halloween Shards of Glass cupcakes. 6. Halloween Oreo Poke Cake.